A few weeks ago, I almost made an impulse purchase and bought our baby a onesie for $14.99 (plus $7.99 in shipping). The price seemed a bit ridiculous especially since babies grow so quickly, but it was really cute and I thought my husband would get a kick out of it. The onesie said “My daddy golfs better than your daddy.” Well guess what- I just finished making it myself for a whopping $1.93*. Score! I also had a ton of fun coming up with my own designs, and anyone who knows me knows I’ll find any excuse to get creative around this house. Since our bundle of joy is still a bun in the oven, he/she obviously can’t do anything sweet for daddy this Father’s Day. I could get all mushy and tell you how much my husband deserves it, that he’s going to be the most incredible father in the world, that this child is the luckiest person ever to have him in his/her life… But I’ll save that for another day. Or maybe I’ll refrain altogether and tell him these things in private. Regardless, I made an adorable craft I want to share with you all. 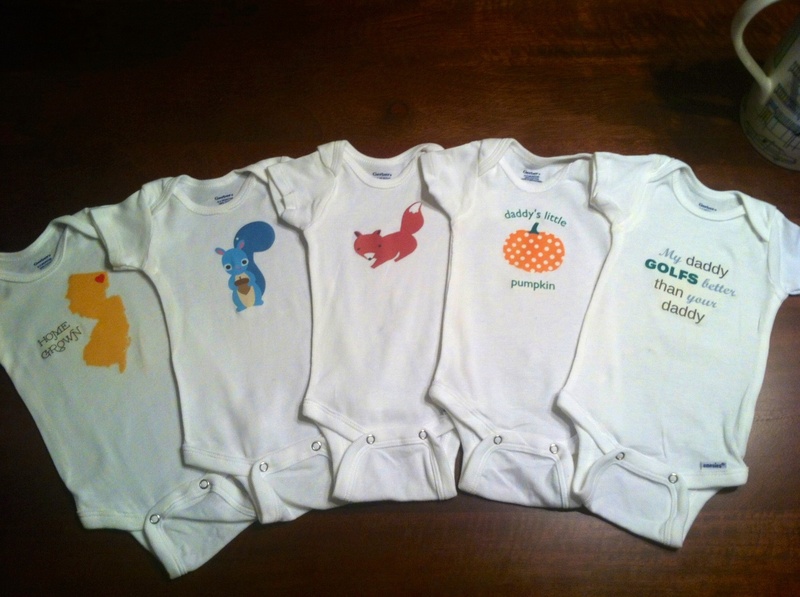 This is a great way to personalize onesies any way you want and save a bit of cash. It’s also a fun activity for baby showers that’s easy and almost foolproof once you get everything set up. 1. Gather your supplies. Assuming you have an inkjet printer and an iron, all you need are a pack of iron-on transfer paper and a pack of onesies. Don’t buy cheap transfer paper. It is more prone to stretching, peeling, tearing or looking crummy in general. Spend the extra couple of bucks and get the good stuff. I went to Staples and bought Avery’s Light Transfer Paper in a pack of six sheets for $9.99. Next, I bought some onesies. I found a five pack of Gerber brand onesies at Buy Buy Baby for $9.99 and used a 20% off coupon bringing the price down to $7.99. 2. Pre-wash your onesies. Don’t skip this step. Most onesies are cotton and will shrink the first time they’re washed. The last thing you want is to go to all the trouble of making cute clothes and have them shrink up all weird once the transfer is set. 3. Start designing. This is the fun part, and the possibilities are endless. You can add any text, pictures, free clip art, and printables you want. Avery has very clear instructions and software you can use, so I played around with fonts and organized all of my designs on one sheet of paper. Utilize the sheets as efficiently as possible so you don’t use up all your paper in one day. 5. Print it out. This is pretty self explanatory. You’ve got your designs, so print them already! 6. Cut it out. Cut around your designs as closely as you can. The transfer paper is clear, but you don’t want it to show. Take the extra time to be diligent and trim your images very closely. 7. Iron it on. You do NOT want to use an ironing board for this one. Heat and pressure are your friends. You want that design to really get pressed into the onesie, so a heat-proof hard surface protected with a pillowcase is what Avery recommends. Pre-heat your iron for five minutes and turn steam OFF. 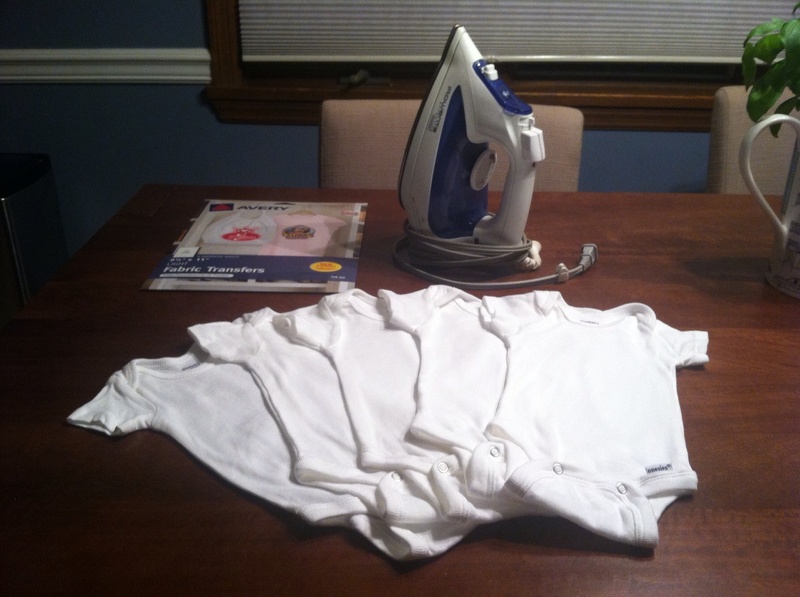 Iron the pillowcase and onesie to make sure you get all wrinkles out, then place your image face down on the onesie. Pay close attention to the edges of the image and press hard. Move the iron around, making sure the heat transfers the complete image. Once you’ve applied sufficient pressure (usually after about two minutes), remove the onesie and let it cool. Very carefully peel the back of the paper to reveal your design. If it seems to stick, don’t force it. Instead, go back to your ironing surface and apply more heat and pressure. 8. Admire all of your hard work! See below for my completed projects. A couple of them are for daddy, and the others are just for fun. Since this craft was so easy and turned out so great, I am eager to make more. *Cost per onesie does not include ink used and assumes you already have an iron and printer. 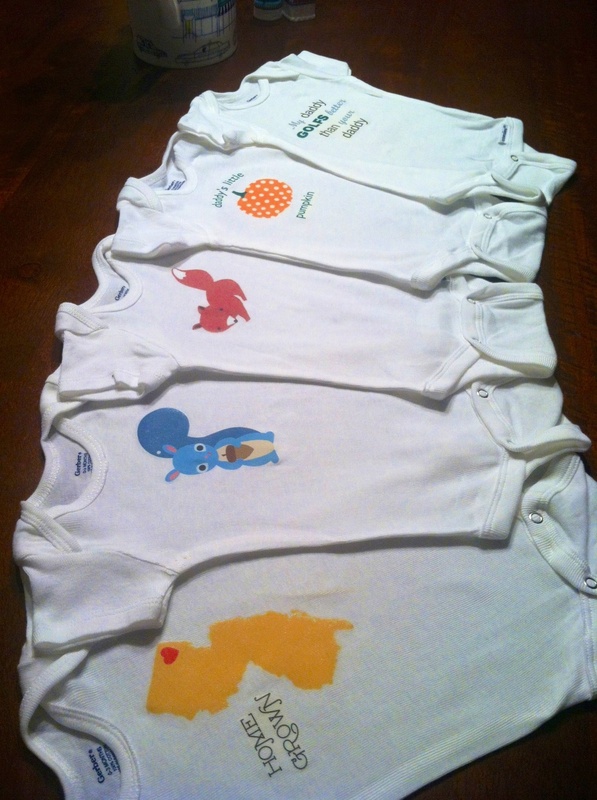 I only used one sheet of transfer paper for all these onesies, so I have five leftover for my next projects.